This post contains 31 photos, one video clip and a lot of words. Grab a cold one, sit back, relax and enjoy. But first of all I'd like to announce the new blog sponsor Minit Medical Urgent Care by publishing an extract from their press release. Minit Medical Urgent Care and Cosmetics to Open in Kahului April 30th. Continuing its goal of meeting the demand for compassionate, quality immediate medical care at an affordable cost, Minit Medical Urgent Care and Cosmetics will open in Kahului on April 30th,2016. 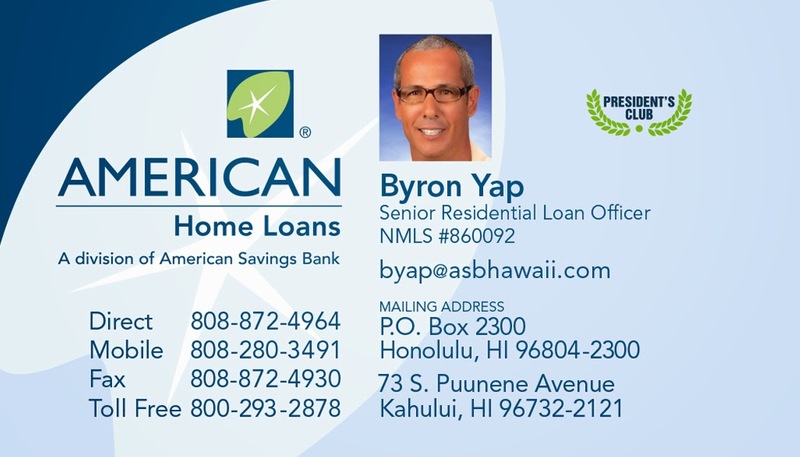 The facility is located at 270 Dairy Road Suite 239, next to Subway and Starbucks in the Maui Marketplace (Lowe’s Parking Lot). This is Minit Medical’s second location on Maui with the first facility remaining in Lahaina. Both of our locations are staffed with providers and assistants with years of emergency medicine experience. The facilities are equipped to perform on-site X-rays, casting, suturing, IV treatments, and lab tests. Grand Opening festivities will take place between 10:00 and 12:00 on Saturday, April 30th with KAOI’s Jack Gist and Cindy Paulos. There you have it. Hopefully you'll never need it, but it's good to know that there's a new place in town that is able to treat your injury if you get hurt on the north shore and don't feel like chancing the possibly long waits at the hospital's emergency room (lately a visiting tourist told me he had to wait 6 hours!). I'm writing this post from Bali and businesses like this are very common here. I used them myself a couple of times: I paid upfront and then claimed a reimbursement with my travel insurance. It worked nicely. Unfortunately I won't be able to go to the inauguration day Saturday morning, but you guys should check it out. Back to the post now. What I'm doing is a short (12 days of possible surfing) trip to Bali. Later in the summer I'll do my usual 2 months long one. Without getting into details, the cost of this trip is zero for me. And I find it hard to say no to trips to Bali at zero cost. 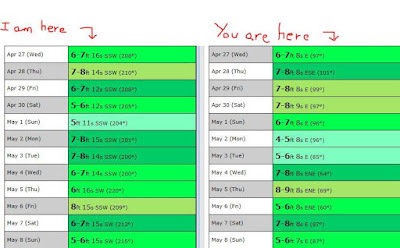 I didn't choose the period based on the forecast, but I got lucky with it and teased my facebook friends by posting this comparison with Maui's north shore's primary swells. I found it odd that the sizes were very similar, but if you look at period and direction you should immediately understand that the right column is mostly windswell. Extremely questionable choice from Surfline to call that "primary swell", but at least they added two more columns right next to it for the "secondary ones" (which I cut out in the crop). 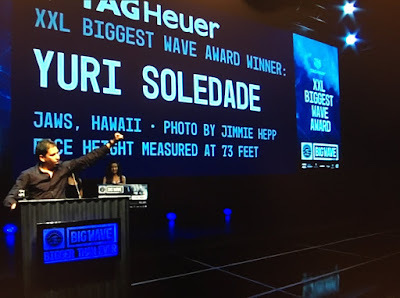 There will be some small NW ground swells and a bit of south energy too for you guys back home in Maui, but check the photos in this post and you'll see what kind of surfers paradise Bali truly is. 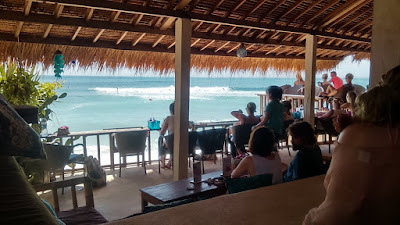 Since there was a shark attack in a Bali spot called Balian a few days ago, I was not surprised to see many comments from my friends about that. Too bad it's a good hour drive from my base and it's an average wave (at least the couple of times I've seen it), otherwise I'd be all over it, since it will probably be pretty empty for a while. Anyway, here's the chronological report of my session of the first four days. 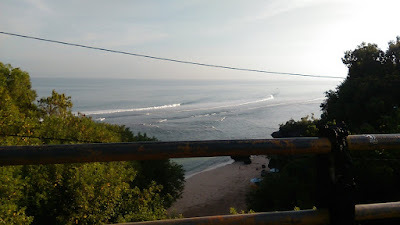 I arrived Tuesday April 26 in the late afternoon and the morning of Wednesday April 27 (don't forget Bali is one day ahead), the energy of a new fairly big swell was in the water. I checked my favorite river mouth at first light and below is how it looked. That spot can have many faces and, despite the deceiving good shape of the wave in the picture, I didn't like how it was sucking almost dry when the big sets came. From what I figured so far, that spot like a medium everything: swell size, period and tide. That day, everything was a little off. I just arrived, I didn't want to get hurt at the beginning of the trip, I said "no thanks" and moved on to a much more mellow wave called Old Mens. The right was holding up quite nicely, but it's a wave that gets soft pretty quickly. The left was shifty and closing out instead. I caught a bunch of the first kind (a good thing is that over there the level of the surfers in the water is pretty average, so I quickly figured out who was gonna miss or go straight) and one final glorious head and a half left closeout to get out of the water. I gave the session a 5. After that, I waited for the early afternoon high tide and went to check the reefs in front of Kuta in the hope they were not going to be too big/crowded. My favorite one is the one called Airport Left, but by sheer luck I ended up on the little taxi boat together with a guy that had already surfed it. 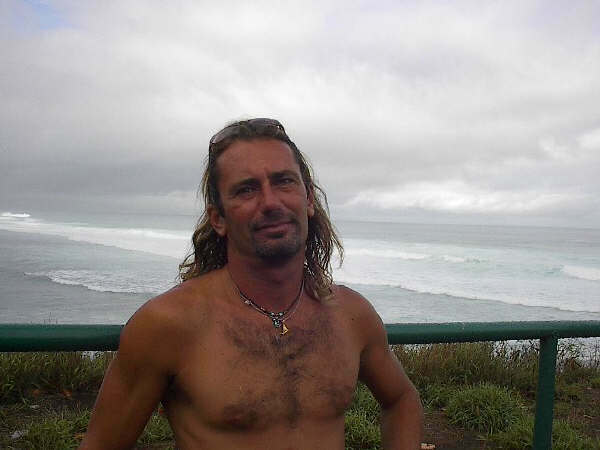 He told me:"on the way back, my boat had to pick up a guy at Kuta Reef and let me tell you: it looked much better. To the point that I just had a very quick lunch and I'm going straight back out there". I trusted him and scored. It was only the third time I surfed that reef and by far the best. 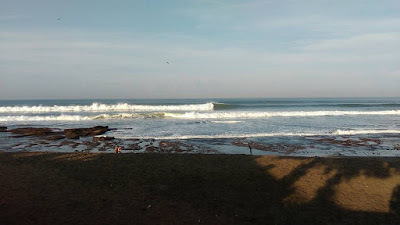 Waves were from head high on the inside to double overhead on the main peak on the outside and anywhere in between. That made for a spread out lineup of 20 people or so and plenty waves for everybody. I had a blast and gave that session a 9. Unfortunately the gopro's battery was dead and I can't visually document that. Beginner mistake not to repeat again: when you travel, you take the gopro battery off. As usual, I woke up pretty early and this time I decided to go check Uluwatu. Not the best call, since the place is a swell magnet and there was still plenty energy in the water, but I knew that there were plenty alternatives in the Bukit area. I was very surprised by how very few bikes were in the parking lot. This is how the warungs looked like. It's a bit of a transition/low season here. You come in full summer (our summer) and there's not an empty chair. The Race Tracks lineup reflected the lack of crowds and that's how it looked in the morning of Thursday April 28: pristine, empty, but DOH plus. Too much for me. I know I could have got a few epic ones like the one below (photo taken later in the day with more people out). But I also know that I would have had situations like in these two photo below, in which you get caught behind the section. If there's a big one behind, that means you're going to get pushed over the reef, and the strong current would push you all the way to the Padang end of it. That means 15-20 minutes of paddling to get back. Not my favorite thing in life, so I wisely chose to move on once again. That's how Impossibles looked from the bridge: the usual deceiving perfection. But I've surfed it enough to know that they named it like that for a reason and had my expectations set pretty low. The wave is just too fast for the common mortals (you can tell by the track of the white water that runs almost parallel to the reef), but there's sections that are a little more doable than others. They say "the bigger it is, the more open it gets". They say the same for G-Land. My answer to both is:"I'm sure that's true, but it gets heavier too!". Anyway, I was happy to remember my land marks for the lineup (I didn't surf it for at least three years) and caught a few, but the most I could do was like 30 yards. Which is a lot better than 3 yards. 10 times better, to be precise. 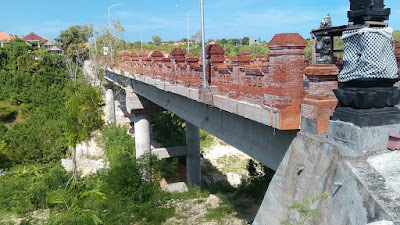 Talking about bridges, the new one to get to Uluwatu from the other non-Padang road was completed at an impressive speed, considering we're in Indonesia. 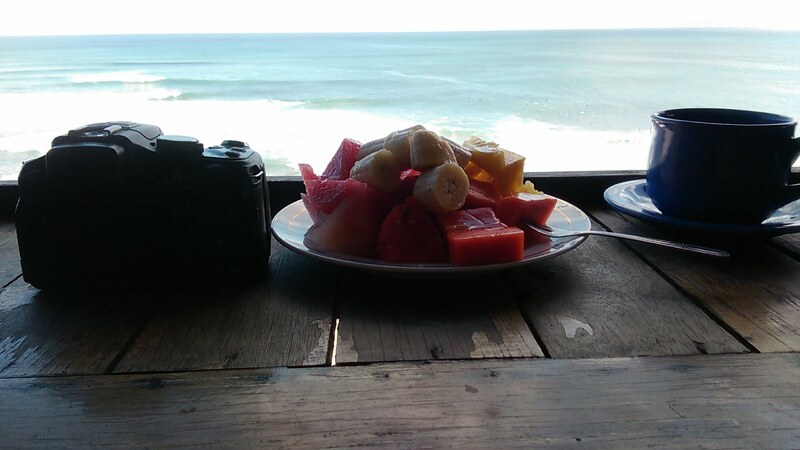 After the Impossibles session, I returned to Ulu's to take pics from the warung and eat some food, one of my favorite things to do in the world. I know, all those warungs are a bit of an eye sore, but they allow me to enjoy what I just said, so I egotistically love them. I also love when a set lines up at Temples. More lined up waves (this time at Peaks): baby, mom and grandma off the back. 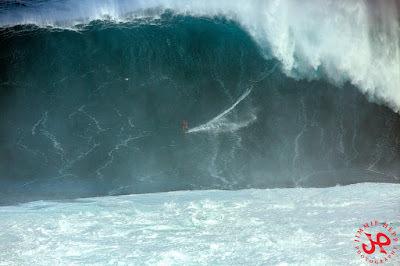 There it is again flying towards the open face of this wave where a surfer is casually bottom turning. And now it's top turning right on top of the surfer. I'm sure it was riding the air flow, as it went the whole wave. And after that I can't miss the opportunity to embed this video, to get to the end of which, you need to be a real big fan of the Family Guy. Piece of cake for me. 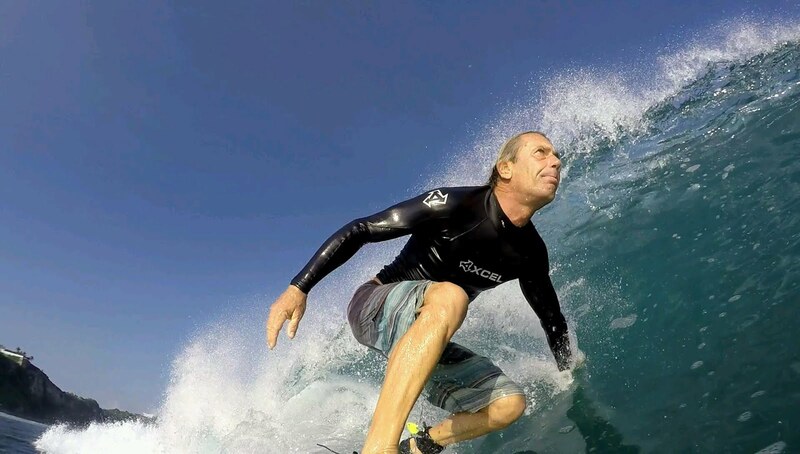 Back to the surfing, I admire top turns with both arms swinging on one side of the body. At that point it was mid morning and the heat was building. 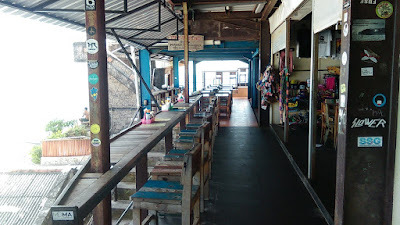 I needed a place with plenty shade from the sun that was going to hit the cliffs more and more directly and I thought about the Kelly's warung in Binging. I had one particular couch in mind and that's the vision I had while laying down on it and reading a book. 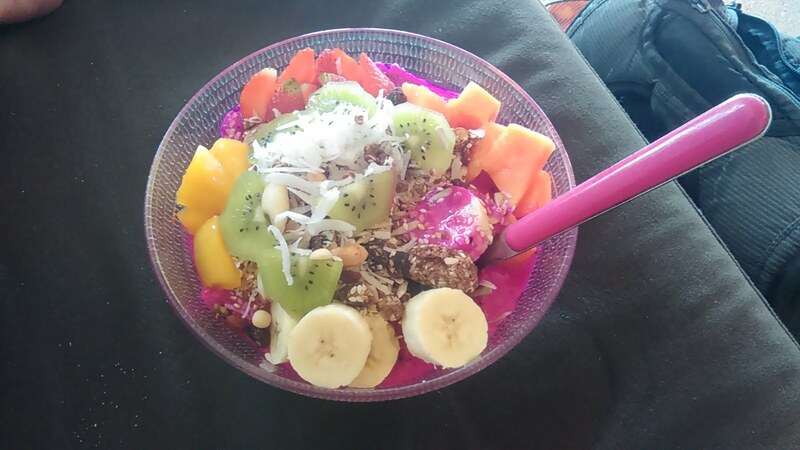 Time for more fruits. This is called Pitaya bowl and the pink color comes from the dragon fruit which is frozen and meshed together with other tropical fruits and some nuts. A clear 10. 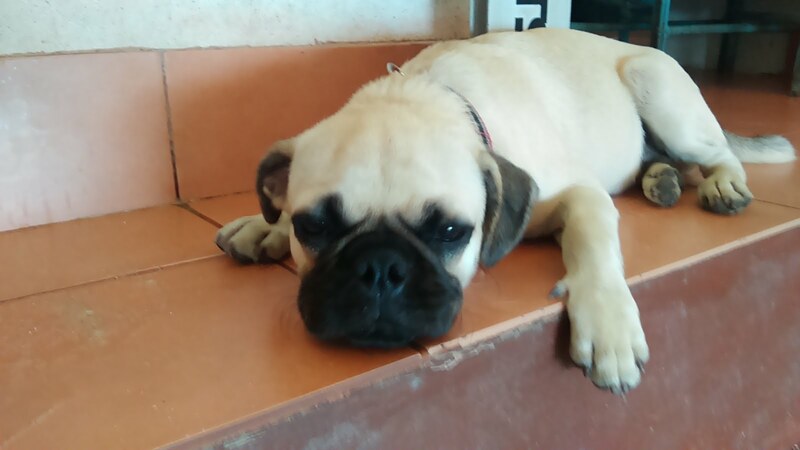 This is Kelly the dog. Sorry, a bit blurred, but too cute to pass. 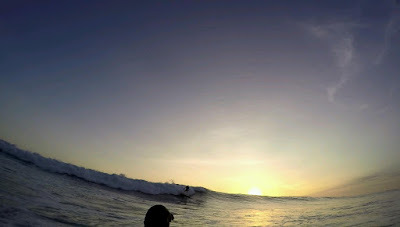 I think this is the fifth year that I go to Indo and Bingin is a spot that I've never been drawn to surf. Just like Pavillions at Hookipa, the take off zone is quite narrow and every body is sitting elbow to elbow. Just like Pavillions, when a good wave comes, pretty much everybody paddles for it. Unlike Pavillions, the wave offers a perfect barrel most of the times. For once, I had my board with me (it's a fairly long and steep staircase to get down from the parking to the water) and I forced myself to paddle out so that I could mark it off the list. I patiently waited 45 minutes for my turn and that's what happened when finally my wave arrived. I paddled straight back in disgusted. Bingin, it wasn't nice to meet you. I needed a fix of good energy and went back to Uluwatu for a sunset session at my favorite break, hoping it had come down a bit. It did, but just a tiny bit. It was still a solid size and I got scared a few times. Facial expression shows clear apprehension caused by incoming bomb. But it was just three of us and no drop-ins or paddle battles to deal with. The guy catching the wave looked well over 60 and got immediate respect from me. Notice the beautiful reflection of the cliffs on the water. Here's the third guy on a medium one in the sunset light. I did catch a couple of bombs myself and ended the day on a good note. I put an arrow to show my "new" extremely sticking out rib: I estimate 2cm (almost an inch) difference with the other side. It's now strong enough that I can paddle on it without the foam piece, but you can imagine it's creating a whole new balance (or lack of there of) that I have to deal with. 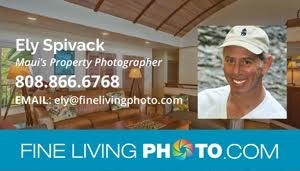 When I go to Uluwatu, I often decide to sleep over. There's tons of cheap home stays that need no reservation. This one has even a decent little garden, but the rooms are as basic as you can imagine. 150,000 IDR are $11 at the actual change, can't complain. I rent the bike from the same guy since 5 years and he gives me his best one (it's key to have at least 125cc if you're going to drive around a lot as I do) for 30,000 IDR a day, a little more than 2 bucks. Everything is so easy and cheap over here, that's one of the reasons why I keep coming back. Obviously the waves are even more important of a reason. I hit the Race Track section of the reef at 6am and it was up to 10 guys all the way to 8am. I couldn't believe it. That's how it looked when I got out of the water because of physical exhaustion. That's how one of the best ones I caught looked from the nose of my board. And here's a clip. I had ones all the way to the end of the reef, this one shut down on me at the end, and you can see how close the reef is. It was actually a mid .9m (3f) tide, it can get a lot more shallow than that. That's why I always wear shoes. My very own strategy is to wear them all the times over there, even in spot/sessions that wouldn't necessarily required them. In this way, I get used to them and I don't get reminded how much better the feel is without them. Yes, it is better to surf without shoes, but with this trick I don't mind them at all. And I didn't get one single cut on my feet in 5 years. Plenty elsewhere, of course. On the way up the stairs, this lovely fellow showed me an unusal very mellow attitude. Maybe he got inspired by this murals right in front of him. Time for food and a few more shots. I can only imagine the harassment this guy must have gone through when walking by all the repair shops on the cliffs. I have to admit that I saw some amazingly well done repairs there though. The conditions were so fun that I went out for two more hours right after breakfast, unexpectedly met two friends from Maui, caught a bunch of more waves despite the crowd now up to a more "normal" level and drove back to my Canggu base. Great day, I give it another 9. I surfed my favorite river mouth in the morning. Alone for an hour and then joined by this fellow young Italian surfer (clearly the fellow doesn't apply to the young part). He told me he surfed one of the Canggu breaks yesterday together with Taj Burrow and Joel Parkinson. Now, that would be cool! I took the photo from the parking lot when I was leaving and I'm so tired from all the surfing I've done so far, that I'm pretty sure I'm done for the day. Stay tuned for more reports the next days. 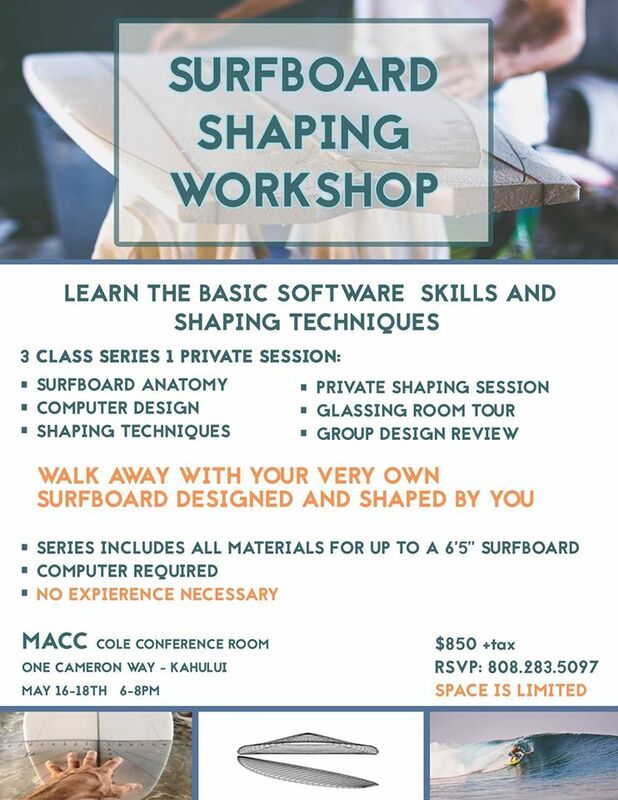 Last but not least, a quick reminder that the surfboard shaping workshop is coming up in May. 7am south shore coming in at knee to waist high and clean conditions everywhere. 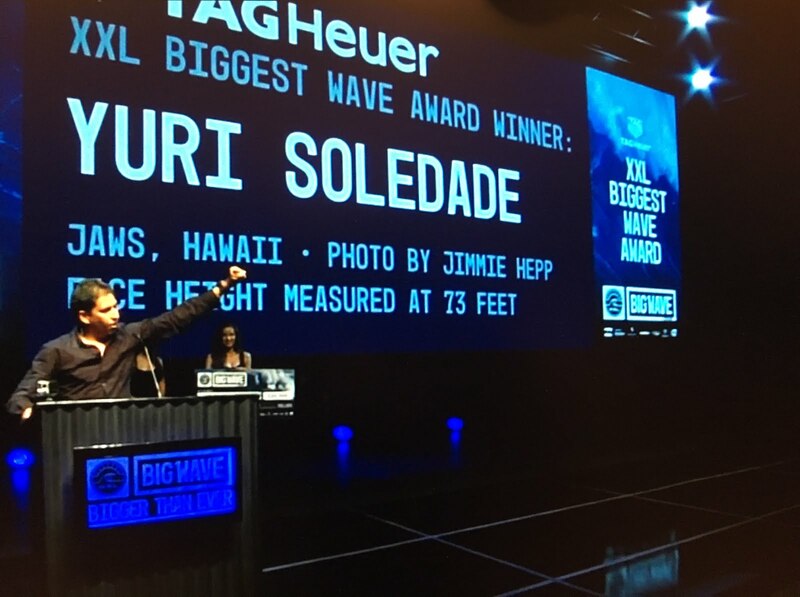 Also big congrats to the other Brazilian Maui resident Andrea Moller for winning the women performance of the year. Yesterday I tuned in the WSL website to watch the award ceremony, but I immediately disliked the format and instead checked out a minor contest that was broadcasted live from... freaking Lance's right in the Mentawais! The commentary and production was as bad as it gets (guess we're all now spoiled by the top WSL guys), but the waves were unreal. I just couldn't believe I was watching it live! Never been to the Mentawais, it's just too expensive compared to the much cheaper options I found elsewhere, so I'll probably never surf it, but now I know what it looks like: like Desert Point, but right. To be honest, Desert can be much longer than that, but the quality of those barrels is undeniable. Here's a photo from Piso Alcala that I took from this page. And it's because I know how to find cheap ways of travelling that I announce that tonight I'll go to Bali for a couple of weeks. 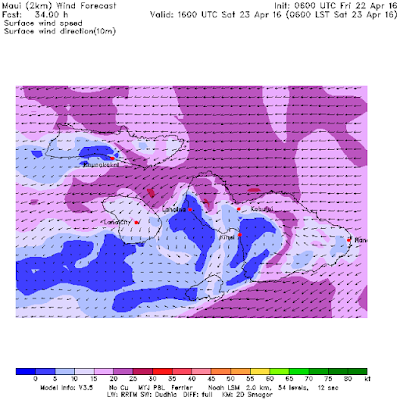 I won't be doing the Maui forecast, but I'll be posting random non-daily reports from there. 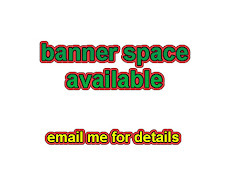 Keep checking the blog, I also have a new sponsor to announce and I'll do that around the 30th. The regular daily calls will resume Monday May 9th. Let's move to today's call, since I got to figure where to go surf today. And you too! The leftover NW energy is much smaller than the past few days at the NW and Waimea buoy, while there's a significant windswell at the Mokapu one. With the Pauwela buoy working, we would have all these information right there, but we have to look around the other buoys instead. Probably Hookipa will still be head high, but with a downward trend. I'll post an update when I see it. Also some energy leftover from the south with very marginal sizes and periods, but I like those long period readings at the Barbers, W and SE buoys. 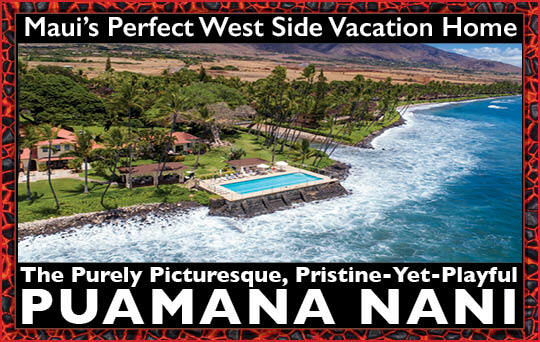 I'll make sure to check the Lahaina webcam before I decide where to go. MC2km maps NOT updated yet, this is the 6am map in yesterday's run. Loos like another windy day. 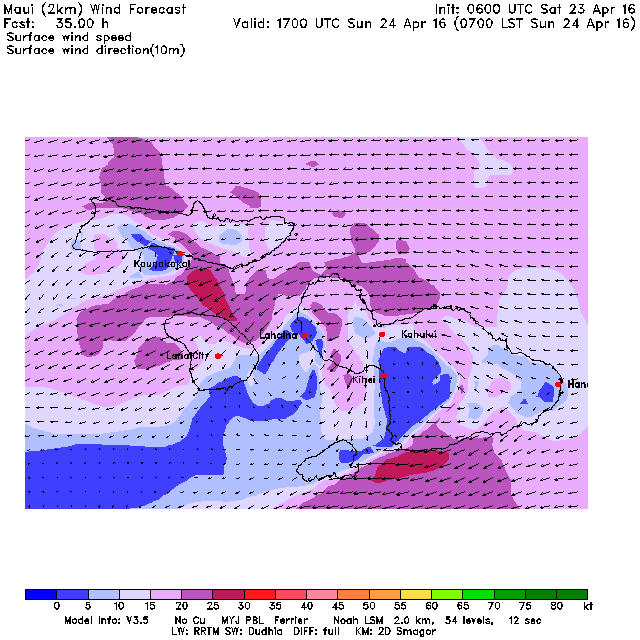 Wind map shows a nice NW fetch and a windswell one. 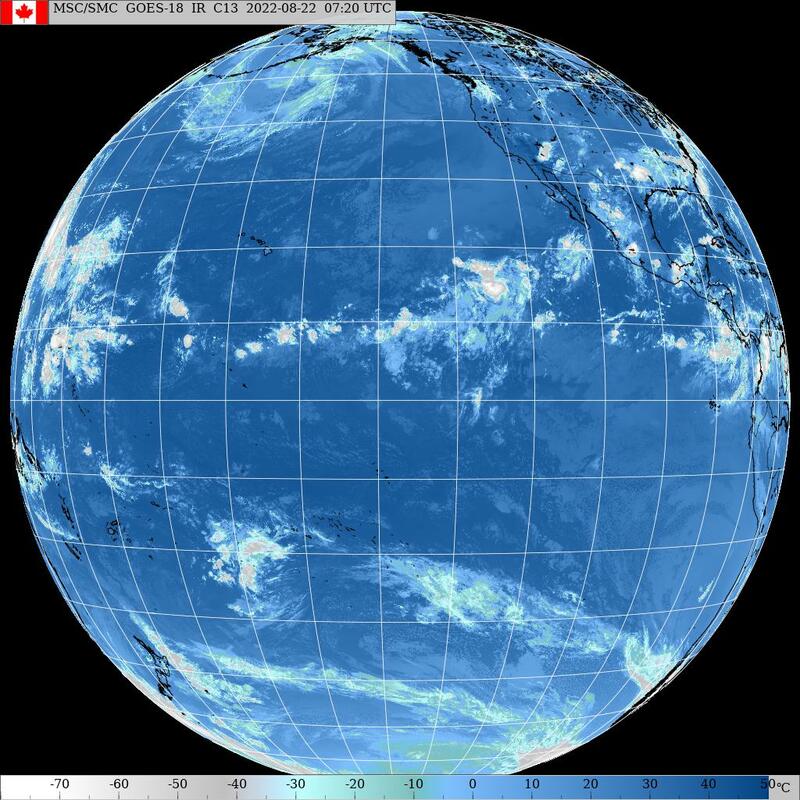 South pacific shows a nice fetch in a good position, you guys gonna have some action while I'm gone. 6am Hookipa is up to head and a half, windy and rainy. I'm out of here, more updates later. Yesterday was a busy day for me that started with a lesson on the south shore. Here's my intermediate student going for a kamikaze takeoff in the middle of a close out. She was at that stage where she would like to more consistently make it to the open face, for doing which it's necessary to take off in the right spot on the wave. How to spot the right spot? You have to look for the peak and an eventual shoulder with a declining slope. In this case, it would have been 15-20 yards to her right. We were lucky enough to be by ourselves with the company of Dave Kalama (that's what happens when you schedule lessons at 5.45am) and even Dave couldn't add much to the topic. "One of the things that indicate the peak is that it's usually darker", he kindly contributed. Then he looked at the small waves and added "well, maybe that applies only to bigger waves...". It's hard to read waves and only experience and time in the water will make it better. When I teach my beginner students it's so evident that they have no clue of what the wave is going to do. It's like advanced surfers have a magic vision and can see things that others can't. But it's not magic, it comes with time in the water. That's why I believe that one hour of trying to surf messy waves at Paia Bay is always better for your surfing than one hour on the couch. After the lesson I had a board delivery in Lahaina and after that I managed to squeeze a session at the bay before an afternoon work shift. The inside bowl at the point looked really fun for longboarding. But the race track at the Cave looked even more fun and I paddled out there. This was a head high screamer that I managed to ride until it unfolded faster that I could go. I don't know how to get speed when I'm grabbing the rail and there's no way I would let the rail go... the gopro flattens the shot, but it's a very steep wall. The guy down the line got the rest of it. There were occasional gems, if you had the patience to wait deep in the lineup for them. 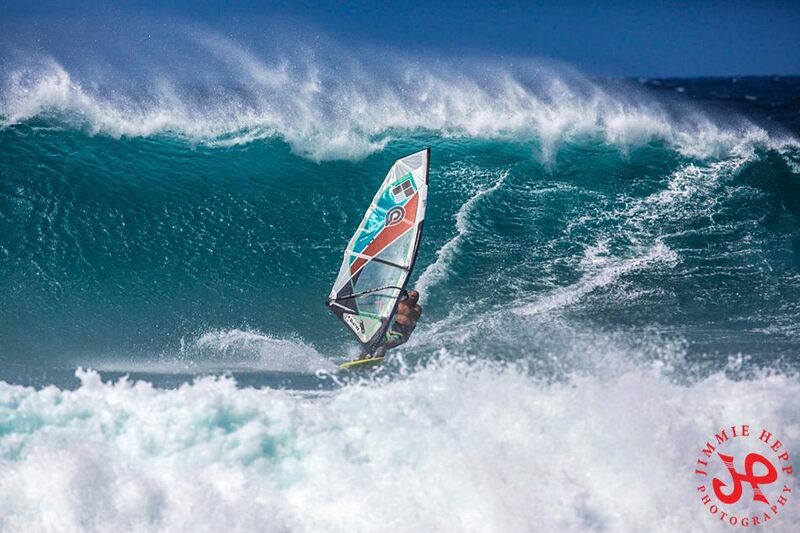 Meanwhile at Hookipa the windsurfers where enjoying another day of wind and waves. 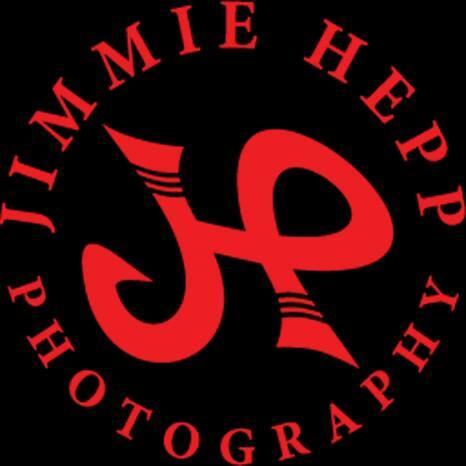 Photo by Jimmie Hepp. Hookipa at sunset looked pretty nice. NW and Waimea graphs below (still with screwed up time line) and the word that describes them is: steady. This is going to be the 5th solid day of this swell. Meanwhile, the south swell is now showing its readings at Lanai and Barbers. 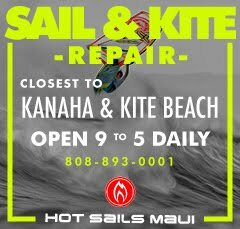 North shore gonna be windy again, at least you have an alternative if you want to escape the wind, but check the webcam before going, as usual. MC2km not updated yet, this is the 6am map in yesterday's run. Seems a little excessive wind, the Hookipa sensor is reading 13mph at 5.15am. Strong and gusty is my call. 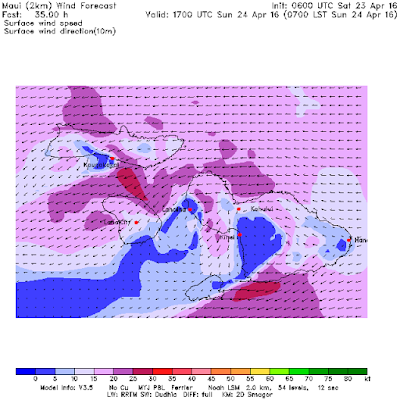 Wind map shows weak fetches. SE corner of New Zealand has a nice fetch, but aimed at the Americas. Small long period angular spreading is what we can expect from it. And that cyclone is right on top of Samoa, I wonder how my friends are doing. 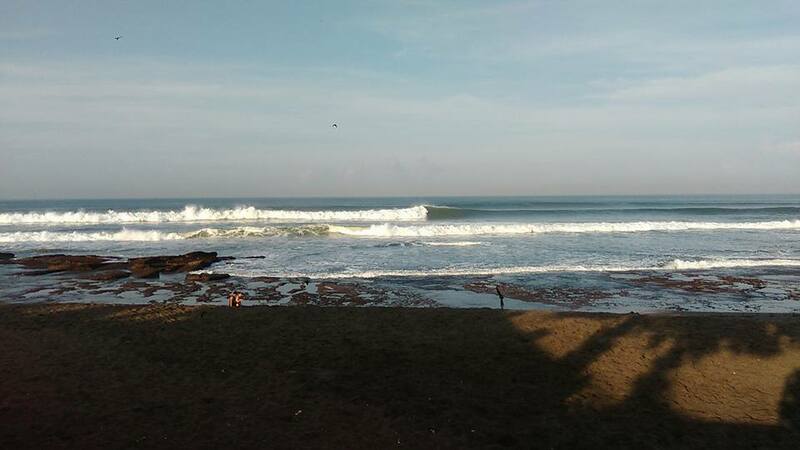 The finals of the interscholastic surf tournament organized by Hi-Tech will start this morning at 7.15am at Pavils and should go on till 3ish. Good luck with the parking. 6.30am Hookipa is doh and a little wonky.